State legislators and Longview city officials Wednesday broke ground on the long-awaited effort to install a plaza and gazebo at R.A. Long Park. About 40 people attended the event, including Sen. Dean Takko, Rep. Brian Blake and Rep. Jim Walsh. The city received about $287,000 from the state for the park improvements. Public Works Director Jeff Cameron said the vision for the park is much more than just a gazebo. The first phase of the project will include a concrete plaza, pathways, electrical upgrades, new lights and landscaping. 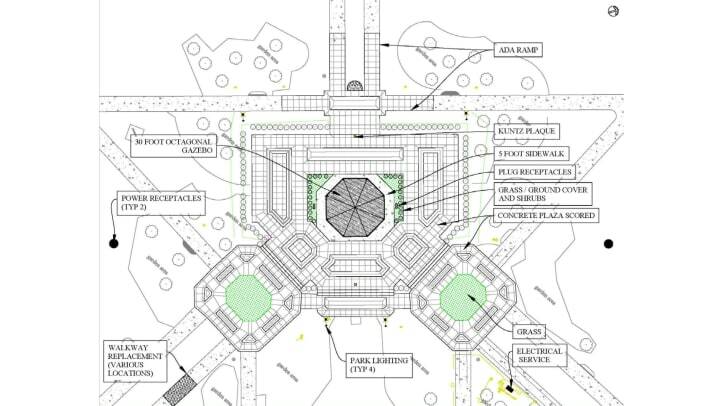 But future plans include benches, picnic tables and a stage area that could hold a variety of performances, he said. The gazebo will also have two plaques dedicated to the Koelsch family, which donated $75,000 towards the project, Cameron said. Aaron Koelsch wanted to honor his family’s 60-year history in the community, Koelsch Communities Liaison Diane Craft told The Daily News. Koelsch could not attend the event because he was out of town, she said.